I recently bought a Jungle Lord. Everything was working fine but then I started hearing a loud static noise. The static only occurs on the speech side of the game and is somewhat random. The normal game sounds are fine. I cleaned and reseated all removable chips on both sound boards and reflowed solder on the entire speech board. After that, everything was working fine for a couple hours but then the same static issue returned. Another strange thing that happened during a game, I did a slap save and the synthesized sounds switched to the beeps and boops. From my research I'm guessing my next step is to replace the ribbon cable between the speech and sound board but I cant find one online to purchase. Does anyone know where I could buy one? Below is a video of the problem. Jakers last edited this post 1 year ago. Anyone have any ideas? 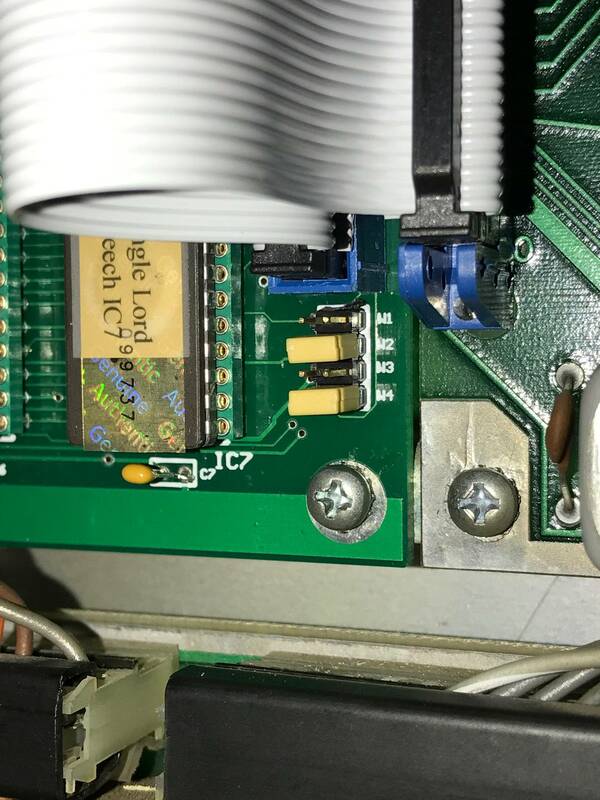 Why is this ribbon cable so hard to find if it's a known failure point? I ended up purchasing a new speech board from PinballPCB since it came with a ribbon cable. After installing it, the static is gone but the speech is not correct. The game plays normal game sounds where there should be speech. There are jumpers on the new speech board but it didn't come with any instructions. Does anyone know what position these jumpers should be at for Jungle Lord? After some research and help from pinballPCB, I've determined my jumpers are in the correct positions. Does anyone have any ideas why my speech is not working correctly? I've tried all the sound board dipswitch positions and cannot get any speech to work. When you press the self-test button on the sound board, does it playback any speech? During normal game mode if the sound board can't detect the speech board, it just plays sound effects instead to prevent silence. When the sound board tries to detect the speech board, all it does is check for the existence of the ROM at IC6 on the speech board. If you have a logic probe, then try checking for pulses to all the address/data/select pins on that ROM when you playback speech events. BTW, are you now getting the same result (no speech) when you plug your old speech board in? When I press the test button on the sound board, all I get is sound effects and no speech. I have not tried plugging in my old speech board. Perhaps I'll try that tonight but I would assume it would just be the same as it was before I bought the new speech board. No speech and static noise. New development. So now when I push the sound test button I get game sounds and the speech. But when I start a game there is still no speech. The speech areas are still replaced with normal game sounds. New development. So now when I push the sound test button I get game sounds and the speech. But when I start a game there is still no speech. What did you do to get the speech in sound test mode working? Make sure you have the two little dip switches on the sound board set to ON which enables speech in game mode. I didn't do anything. It was just working all of the sudden. My dip switch only has an "open" on it. Would that be the OFF or ON side? He speaks! I messed around with the dip switch settings and found that it works correctly when I have switch 1 set to OPEN and switch 2 set in the other direction. We'll see if it lasts or if I have a sound board problem as well.